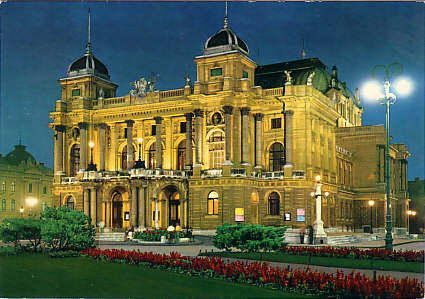 Built 1894-1895 as "Königlich Kroatisches Landes- und Nationaltheater" by Ferdinand Fellner & Hermann Helmer after 14 years of local political dispute over plans and location of the new theatre. 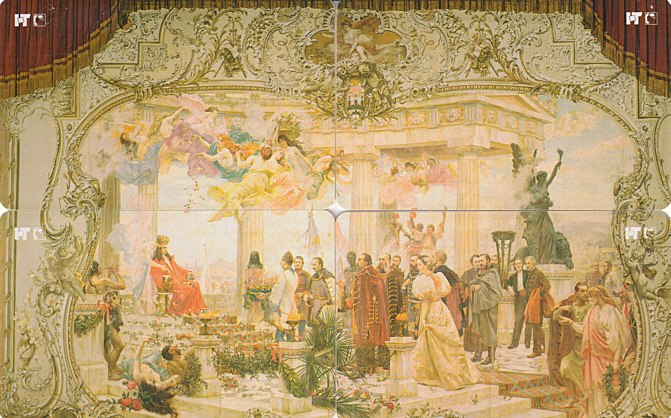 Opened 14 Oct 1895 with Ivan Zajc's opera "Nicola Subic Zrinsjski" in presence of the Austrian Kaiser Franz Josef I. 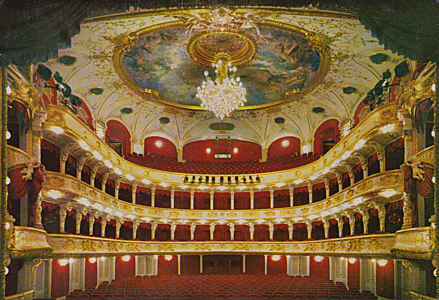 1200 seats. 1952 building of an underground air-raid shelter. 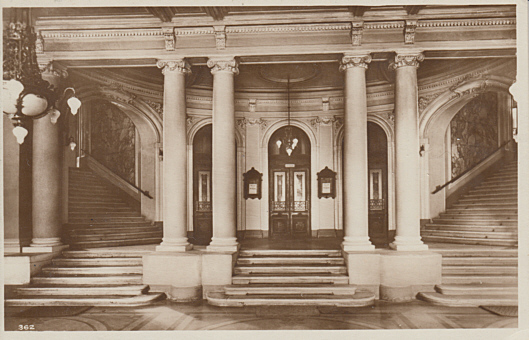 1965-1969 interior modernization by Prof. Raschiza (inlcuding conversion of the 1952 shelter into a buffet). 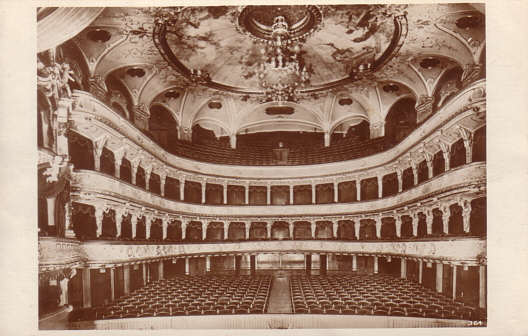 800 seats. 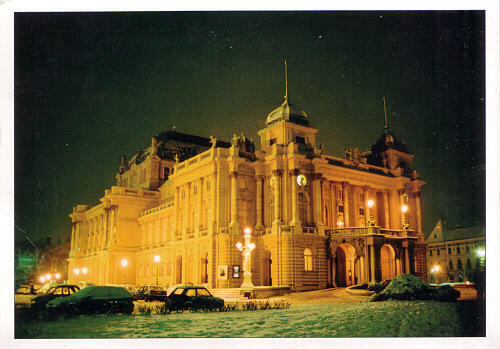 Front Text: "Pozdrav iz Zagreba. 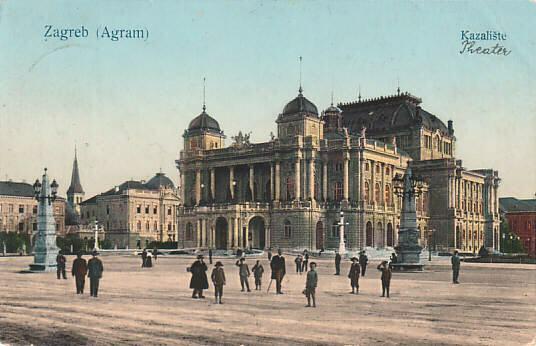 Gruss aus Agram. 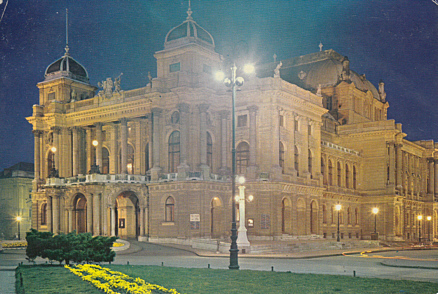 ", "National-Theater. 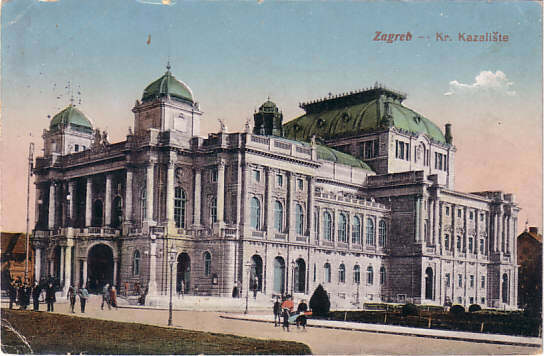 Kazalište"
Front Text: "Zagreb. 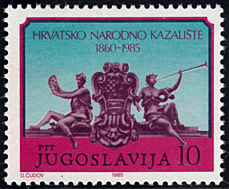 Kraljevsko-zemaljsko kazalište. Agram. 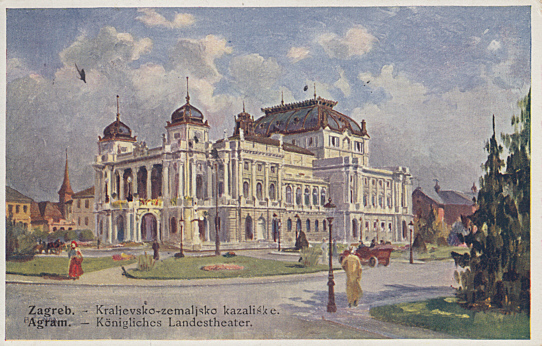 Königliches Landestheater"
Front Text: "Zagreb (Agram), Kazalište"
Front Text: "Zagreb, Kr. 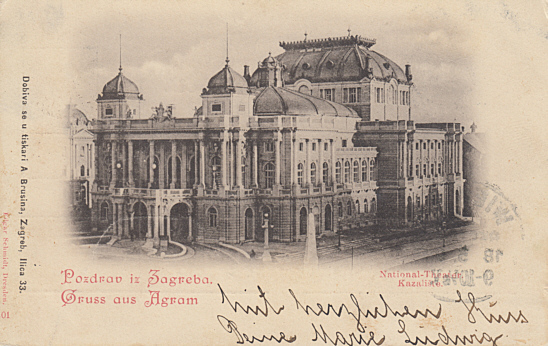 Kazalište"
Front Text: "Zagreb, Narodno Kazaliste - Gledaliste - Theatre National - Salle pour les spectateurs"
Reverse Text: "Zagreb, Narodno Kazalište. 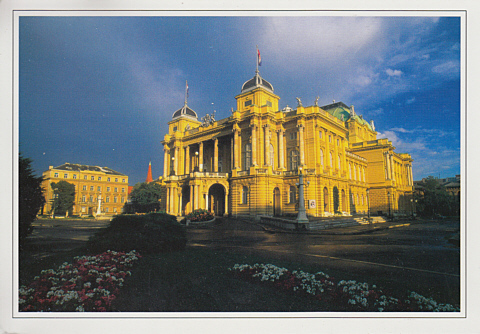 Preedvorje. 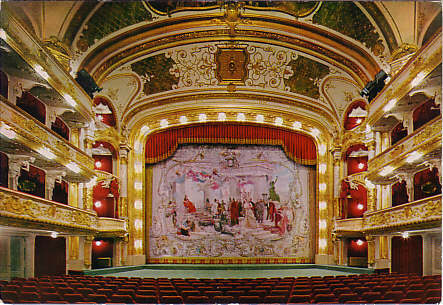 - Theatre National. 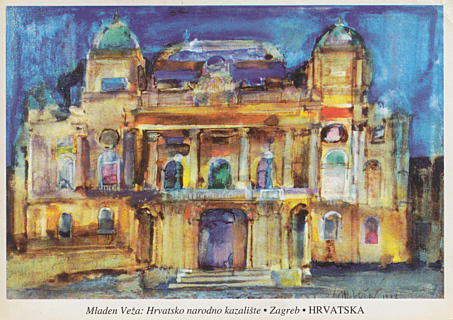 Vestibule"
Reverse Text: "Zagreb, Hrvatsko narodno kazalište. 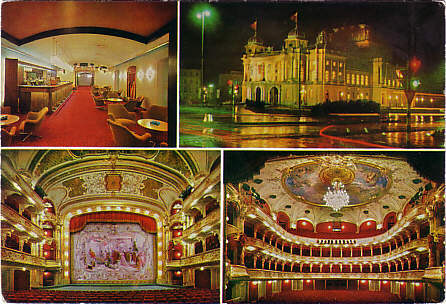 Kroatisches Nationaltheater. 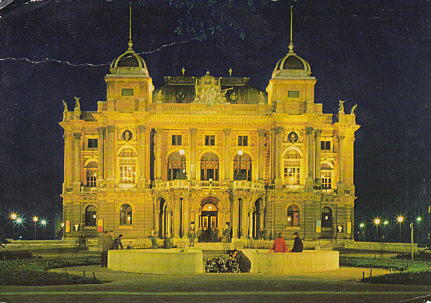 Croatian National Theatre"
Reverse Text: "Zagreb, Kazalište nocu - Theater bei Nacht - Theatre at night - Théâtre, vue nocturne"
Reverse Text: "Zagreb, kazalište - theatre - Theater - théâtre - teatro"
Reverse Text: "Zagreb, Hrvatsko narodno kazalište"
Text: "Hrvatsko Narodno Kazalište 1860-1985"
Front Text: " Mladen Veža: Hrvatsko narodno kazalište - Zagreb - Hrvatska"